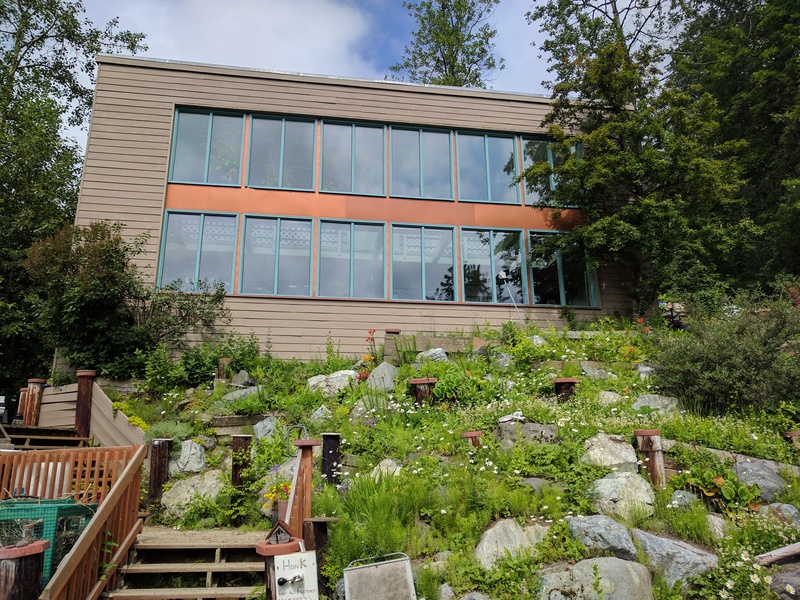 A primary visit site in Alaska was the Bioshelter. 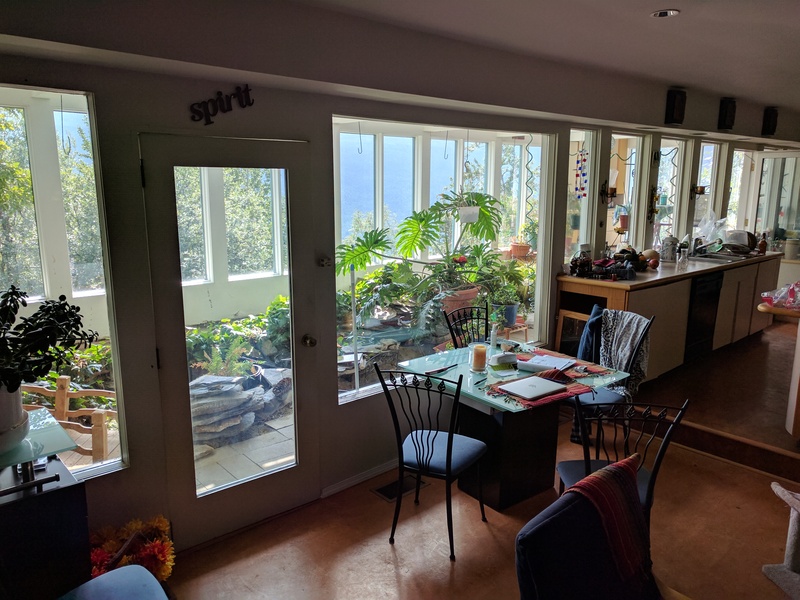 While doing research on this experimental dwelling, I discovered that it is owned by the only permaculture teacher in Alaska, Cindee Karns. 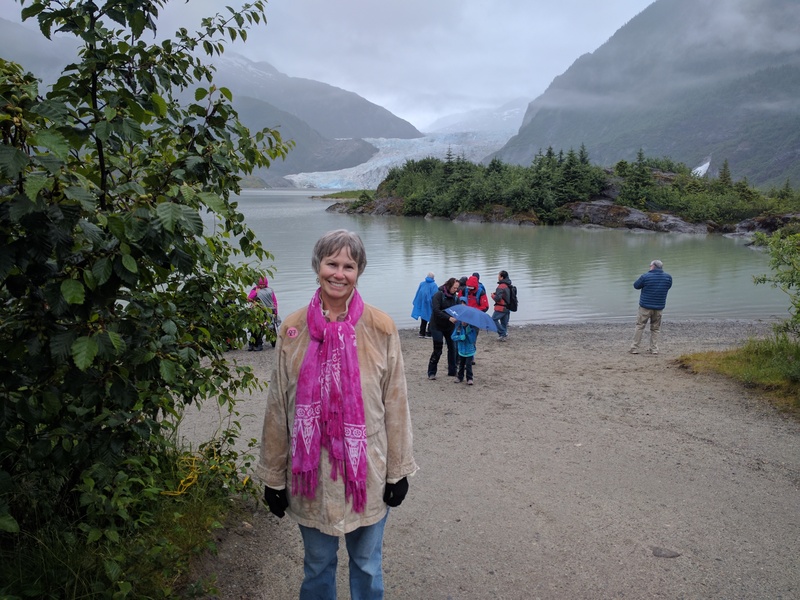 Her husband, Curt, is the Executive Presbyter (like a bishop) of the Yukon Presbytery (like a synod), which encompasses the whole State of Alaska. 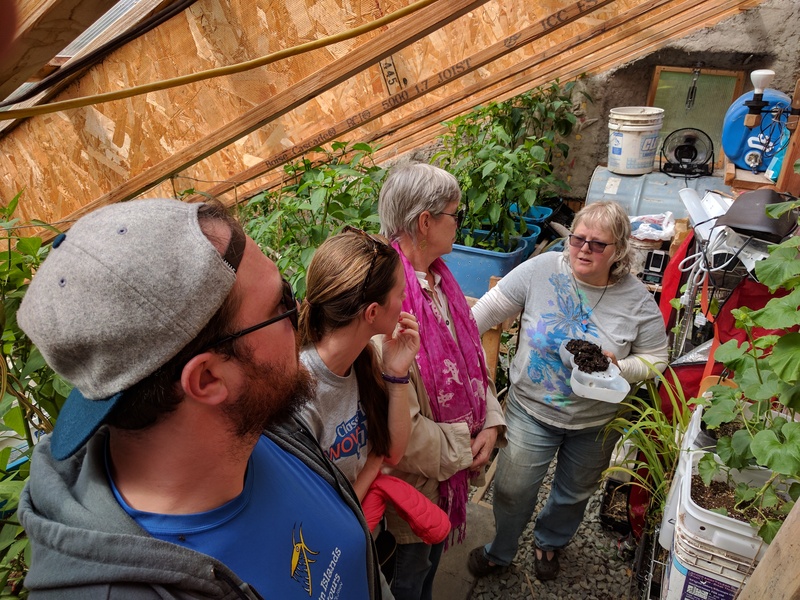 Cindee is also the founder of the Alaska Cold Climate Permaculture Institute. 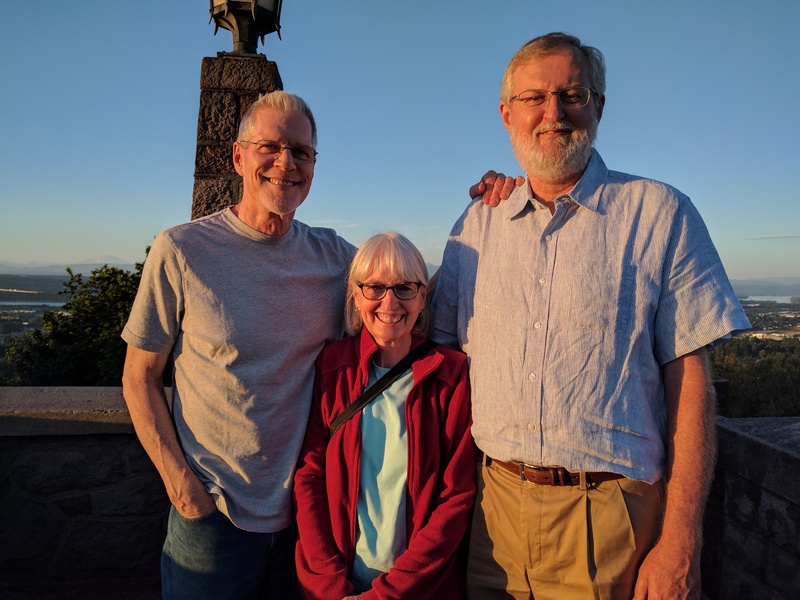 It was amazing to discover these connections, related both to religion and permaculture at this well-known site. And we had a lovely visit. The Bioshelter was built in 1987 as an experimental design for Alaska housing. It collects rain and snow melt into two 5,000 gallon tanks and recycles it over and over again. Waste is also recycled on site using composting toilets. 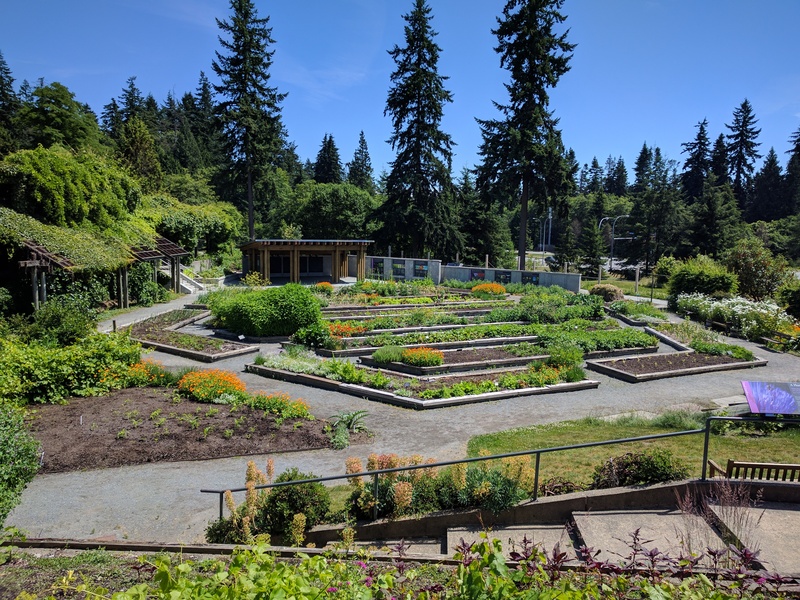 It’s an impressive combination of inventive devices, ponds, and plantings that assist in this work. There is no well or septic system. Here Cindee demonstrates her process for generating worm castings, a potent way to build soil. We are in the greenhouse she designed and built into a very steep hill alongside her garage. Here’s the South-facing front of the Bioshelter. 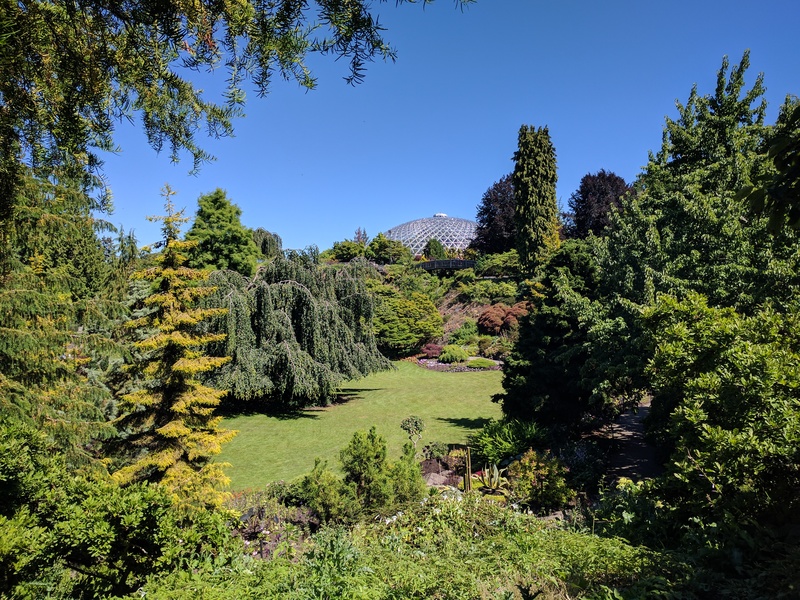 You can see the greenhouse-like design of the original house. Here’s some of the water processing infrastructure inside. This is taken from the living room looking into the internal greenhouse and showing some of the interior kitchen. 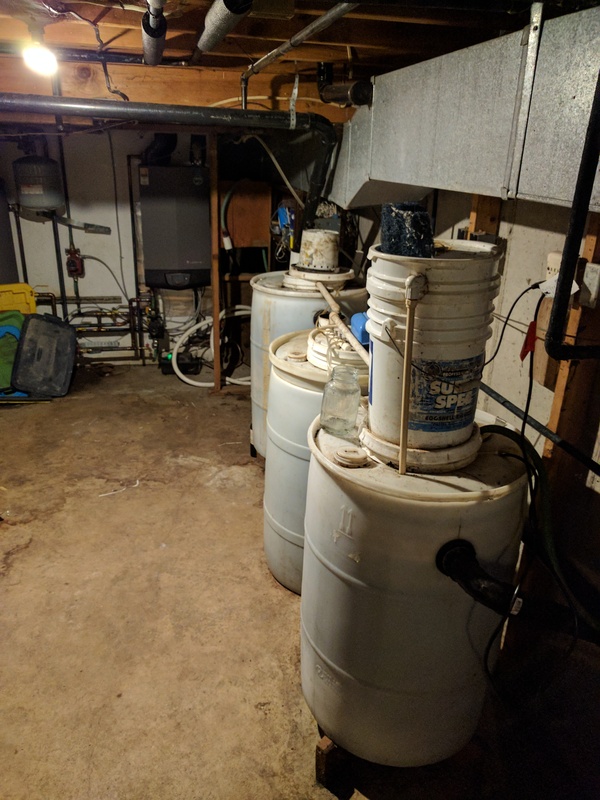 Here’s more of the water treatment equipment in the basement. 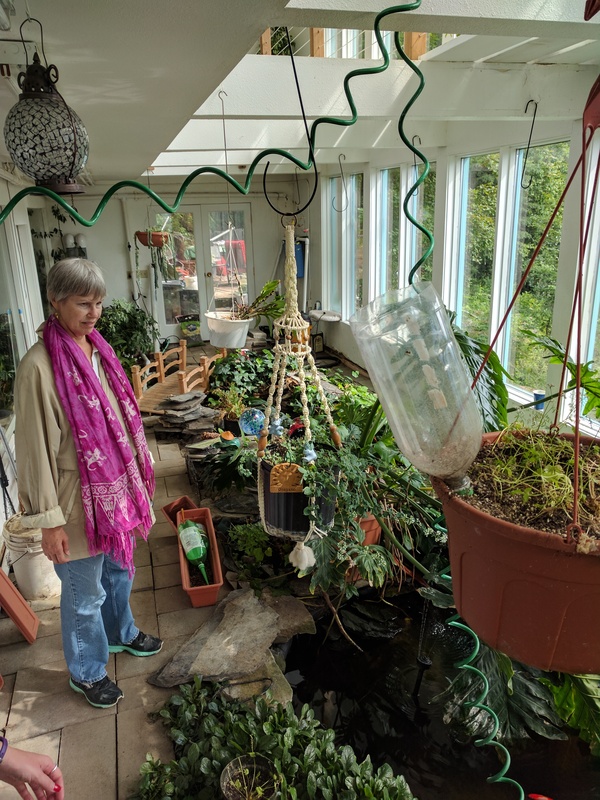 Cindee and her husband have made significant improvements in the systems over their ten years living in the Bioshelter. It’s an impressive and inspiring example of what can be done with water and waste recycling, as well as food production, in a sub-arctic climate. Electricity, however, comes from the grid. Alaska is too far north for solar-based electricity production to be cost-effective. Wildlife is one of a handful of major reasons folks make the trek to this remote state. We have seen many dozens of bald eagles, several whales (Humpback), salmon, Dal’s Porpoises, and even a moose. 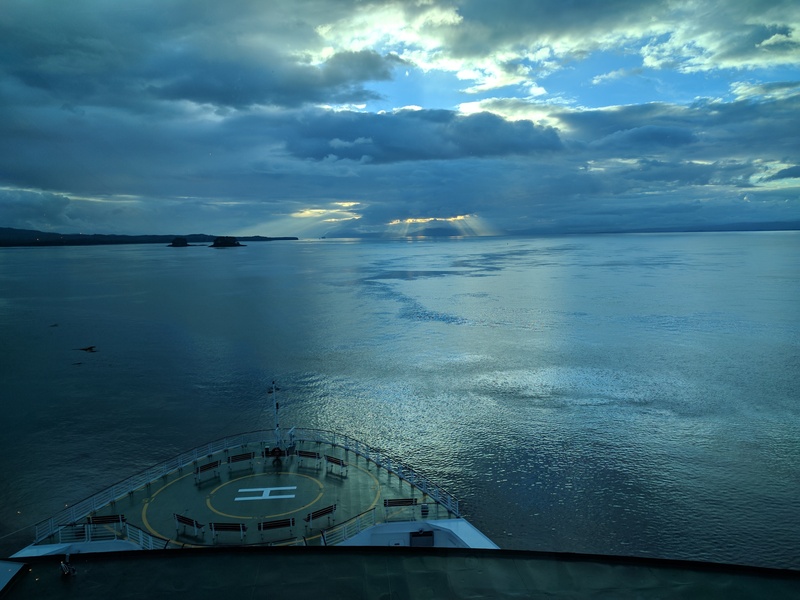 Here’s a striking sunset on the evening we sighted the whales while traversing Snow Pass, a narrows in the Inner Passage that concentrates the underwater creatures who navigate the waterway. 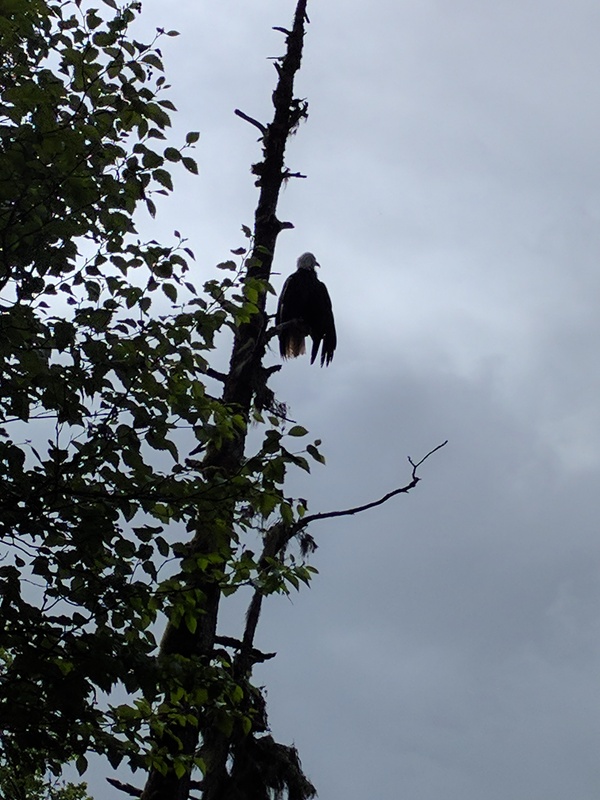 Here’s one of the eagles we saw at Icy Strait Point, shedding some of the rain from its feathers. Another bit of wildlife at Mendenhall Glacier outside Juneau. 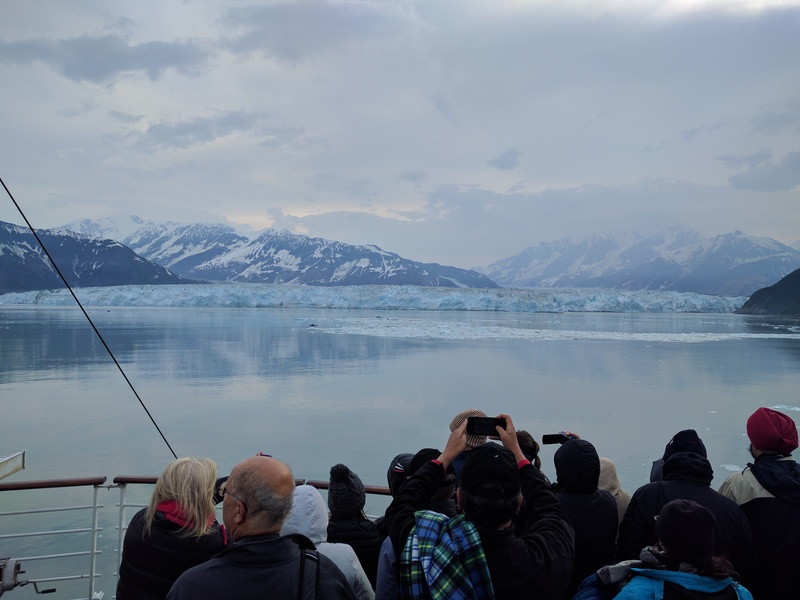 The glacier is receding at a rate of about 150 feet per year. We hiked about a mile and at various places, etched in stone on the path are eerie reminders, “glacier limit 1939,” “glacier limit 1916.” The naturalist who offered excellent presentations on the cruise noted that he is not aware of any of the couple hundred thousand glaciers on the planet that are advancing. They are all retreating. Even Hubbard, which occasionally appears to advance, is retreating. The appearance is due to sliding, caused by melt water under the glacier. It is called extending. Hubbard is loosing significant mass. Folks crowded on the helipad Thursday morning to view Hubbard. It was an unusually warm and clear day, though cold near the glacier. We got in to within a mile, carefully avoiding the bergs along the way. 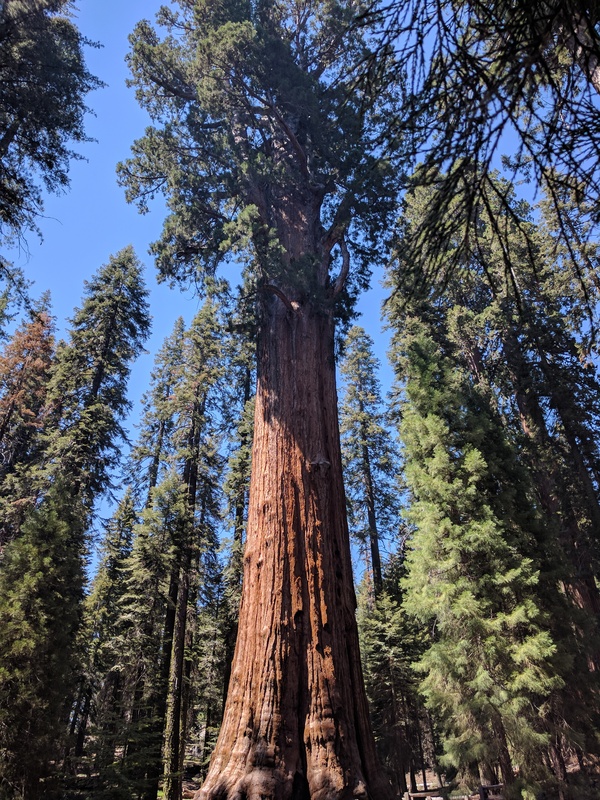 It is about 200 feet tall at the face, and we both saw and heard some “calving.” When portions break off, it sounds like thunder. Having completed the cruise and now with access to the internet (in Anchorage), it’s time to catch up a bit. 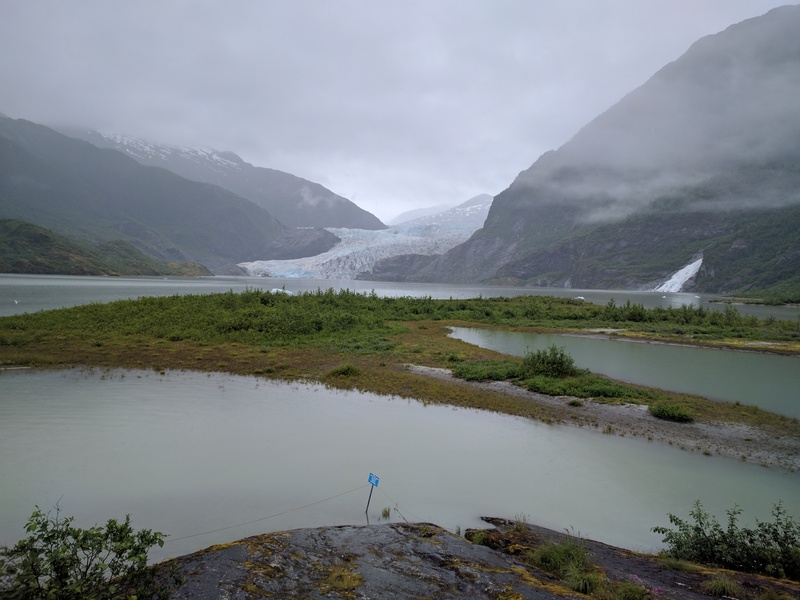 The stops were Ketchikan, Icy Stait Point, Juneau, Skagway, Hubbard Glacier, and Seward. 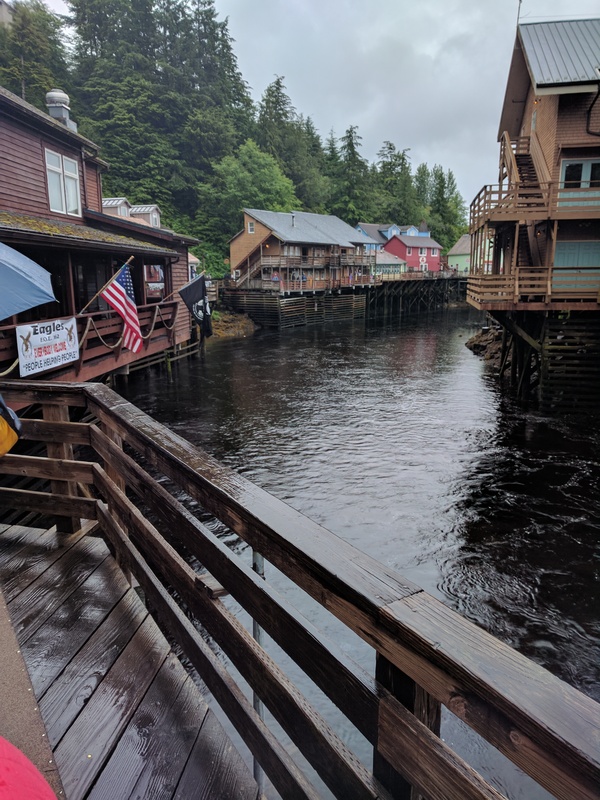 From a cultural standpoint, Ketchikan was the most rewarding. 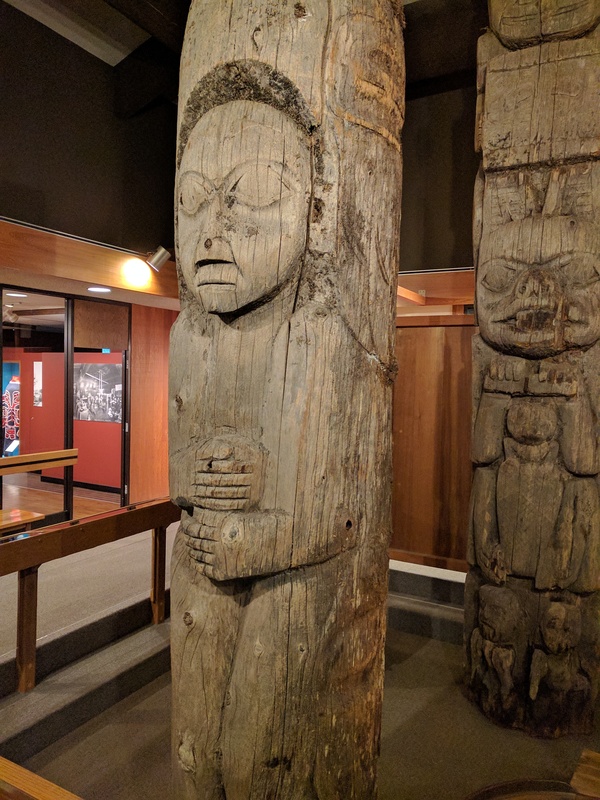 The Totem Cultural Center there houses a significant collection of original 19th century Totem Poles of Tlingit, Haida, and Thimshian creation. As is the case for many other native peoples, these groups have been dealt with rather harshly as Russians, Europeans, and later U.S. Americans claimed, bought, plundered, and sold their native lands without consultation or consent. 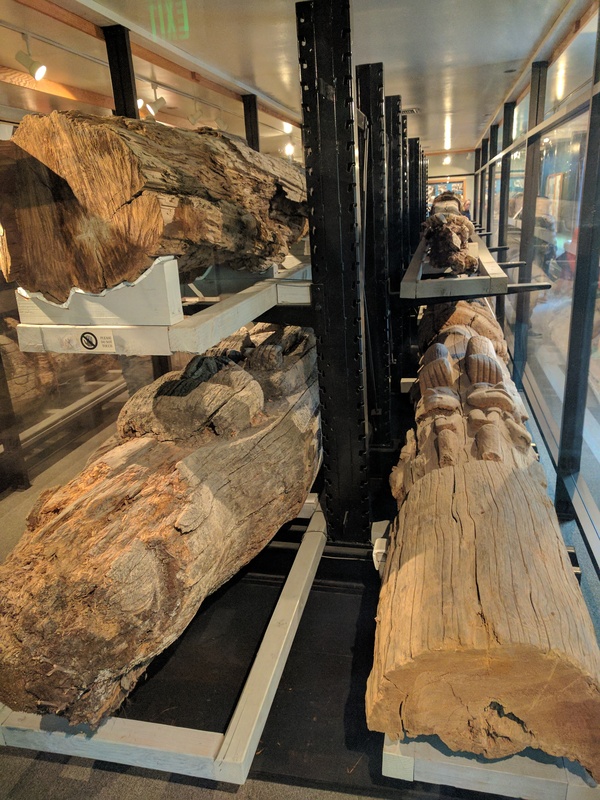 The cultural center is one of many organizations working to preserve cultures that struggle to maintain connections to pre-Columbian roots. There are a few signs of hope, perhaps more so here in Alaska than in the lower 48, due to the ruggedness of this place. 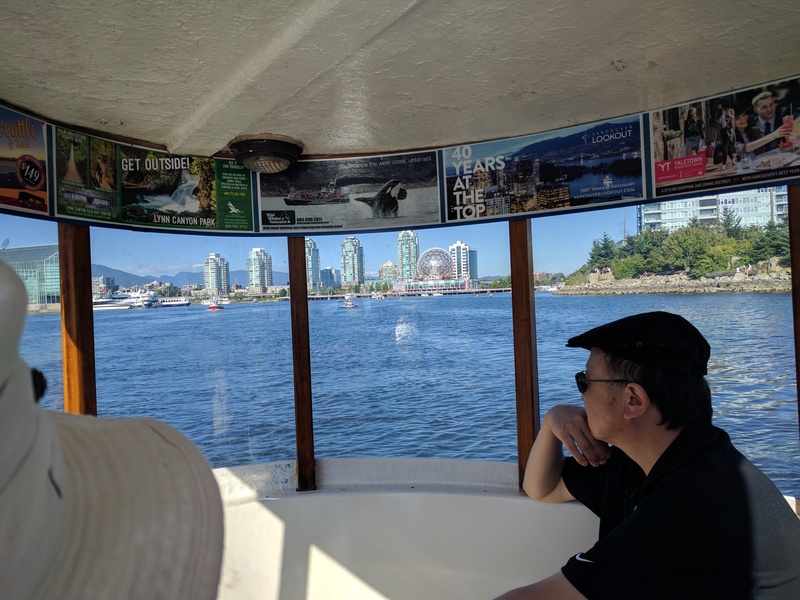 Many cities and settlements are accessible, for practical purposes, only by water and air (and, as a guide helpfully noted, the birth canal), which facts have cut down on direct molestations from outside. And there are some creative adaptations to consumer culture. 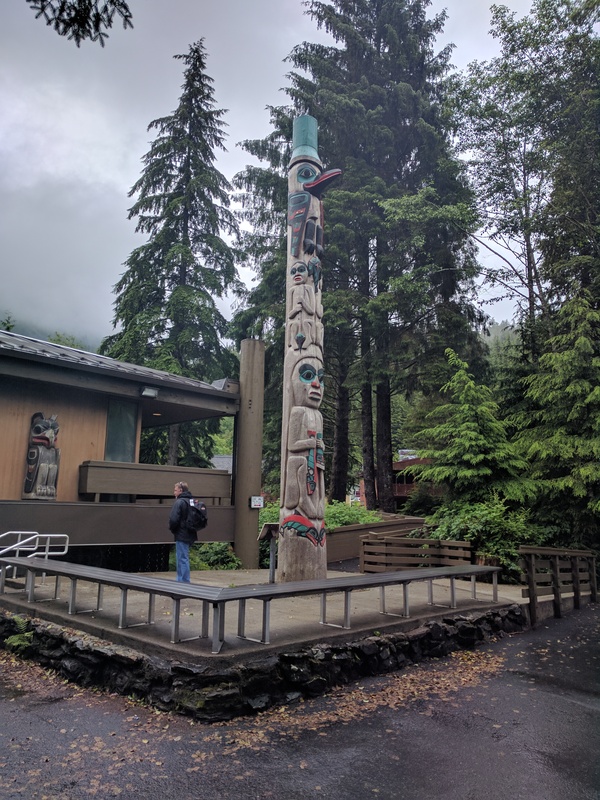 Icy Strait Point is a wholly native-owned location, developed specifically as a cruise stop. There were two ships in this tiny place on the day we were there. There is only one useable dock, so the other ship anchored in the harbor and ferried passengers to shore using their emergency boats. 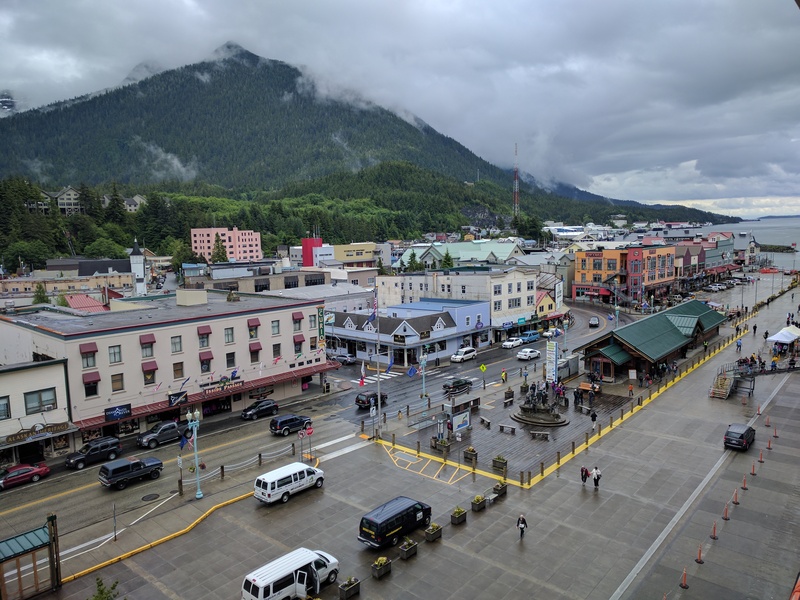 Ketchikan is known as the salmon capital of the world. Hundreds of millions of salmon are caught or farmed annually in Alaska. 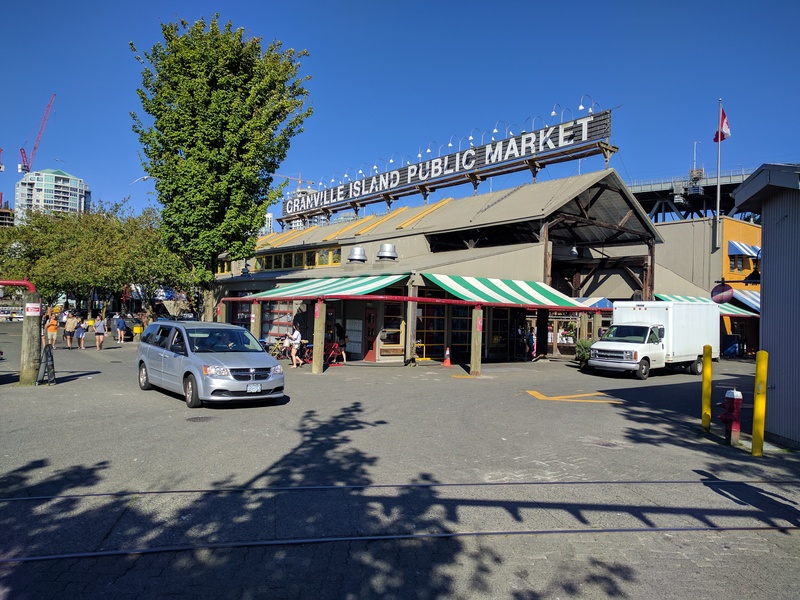 At each stop, salmon lore and products were prominently featured. 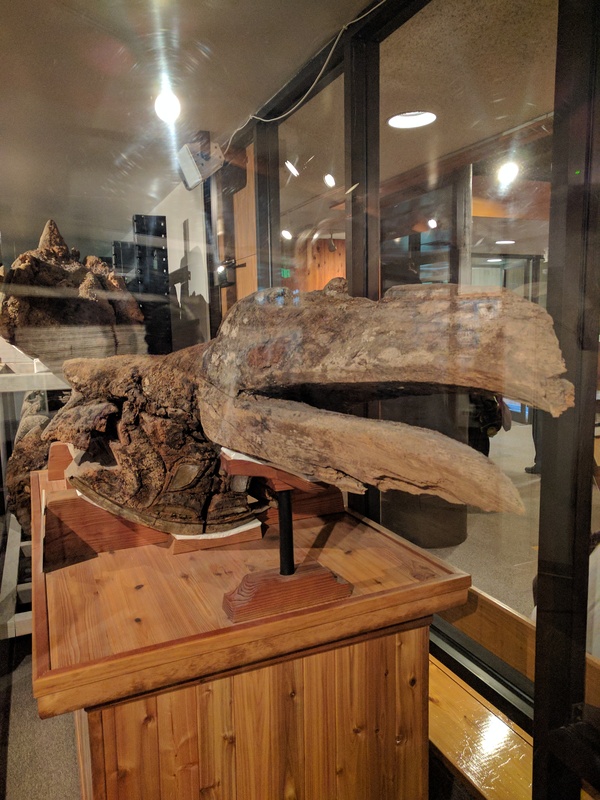 From totem to table, the salmon is the subject of massive attention. And properly so. It is delectable and versatile. I wonder, in this connection, at the massive quantities of gravlax consumed at the breakfast buffet on our cruise ship. One morning, while waiting for my bagel to toast, an entire tray of the stuff disappeared. I let it out of my sight for a mere few seconds, and when I turned again it was gone, caput, vanished into the ether. Not to be daunted, I walked to the other side of the ship where the mirrored buffet yielded sufficient thinly sliced pink flesh for my use. What a feeding trough (! )–our somewhat affectionate, somewhat disdainful term for that place of endless and sickening bounty and waste. 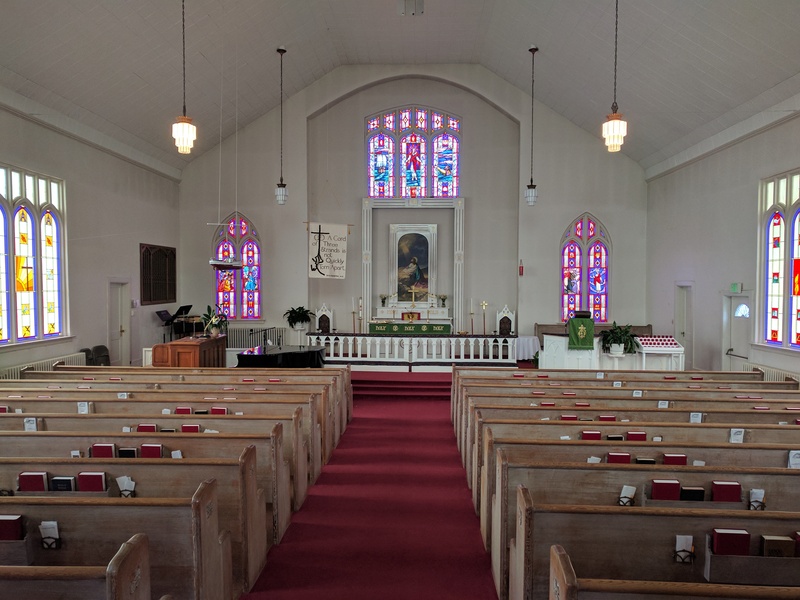 I had looked up ELCA congregations I might visit in advance of the trip. 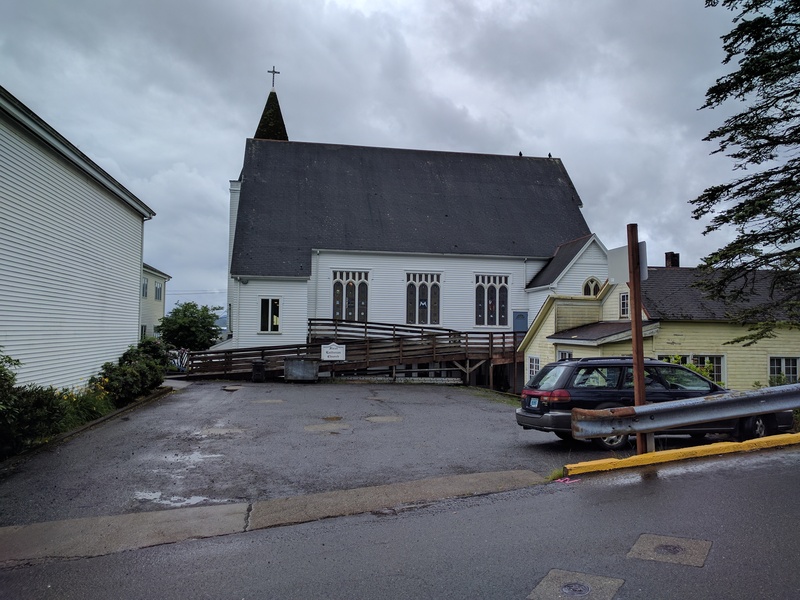 Here’s a picture or two of First Lutheran in Ketchikan. Amazingly, the pastor there had just completed a Lilly Endowment-funded sabbatical! How cool is that? 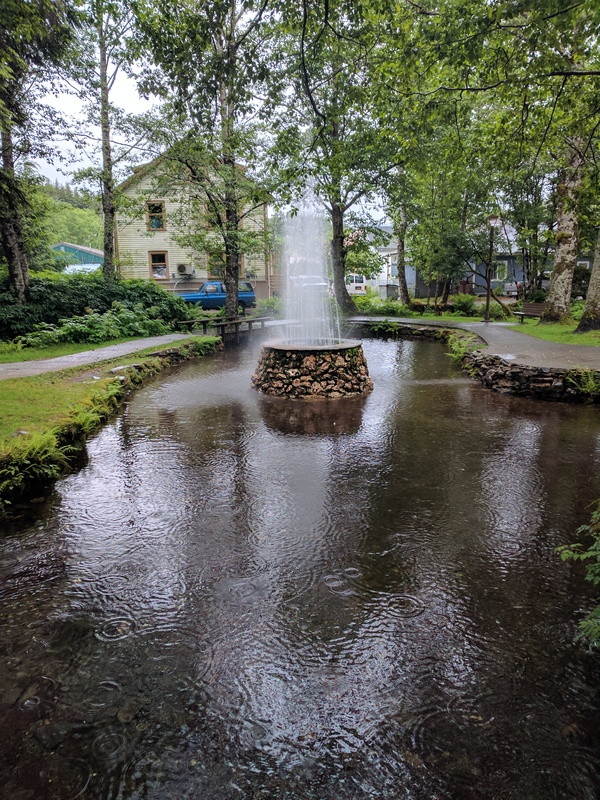 Ketchikan is a picturesque place. These shots capture something of its charm. This last photo is from our balcony just prior to departure. It was about 70 degrees today. It’s wonderful to be far enough north to find balmy weather again. Not surprisingly for a northern City, everyone was out today. It’s also the Monday of Canada Day (7/1) weekend. We walked for nearly seven hours with breaks for snacks. A great day. 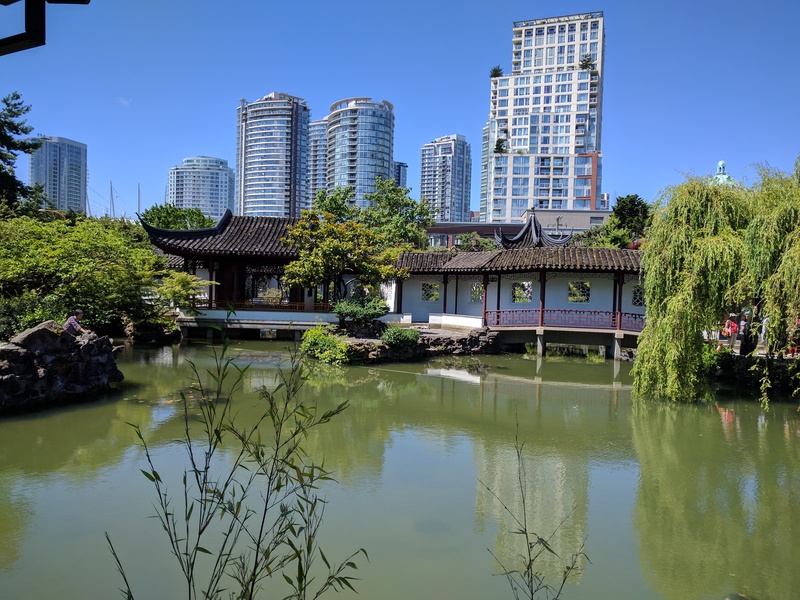 Dr. Sun Yat-Sen Classical Chinese Garden, with the city behind. Our Airbnb is in Strathcona, a neighborhood just east of Chinatown. 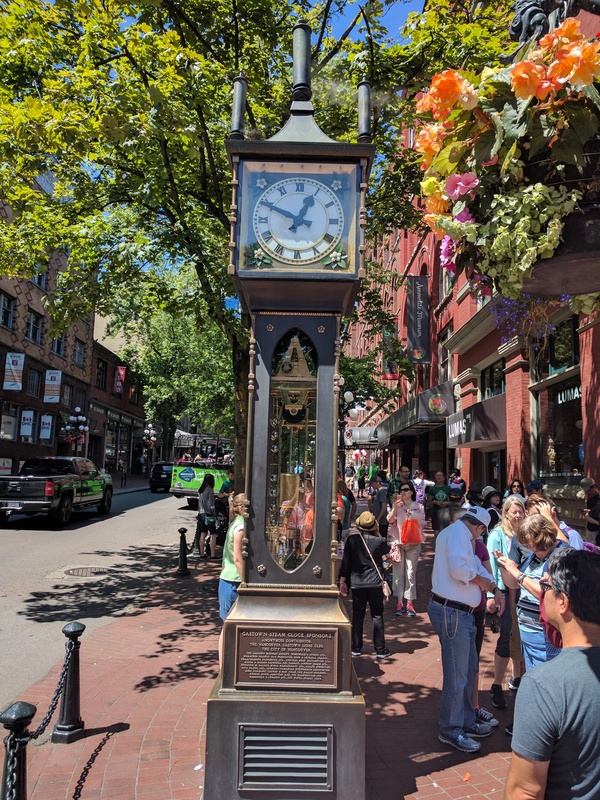 The famous stream- driven clock in Gastown. 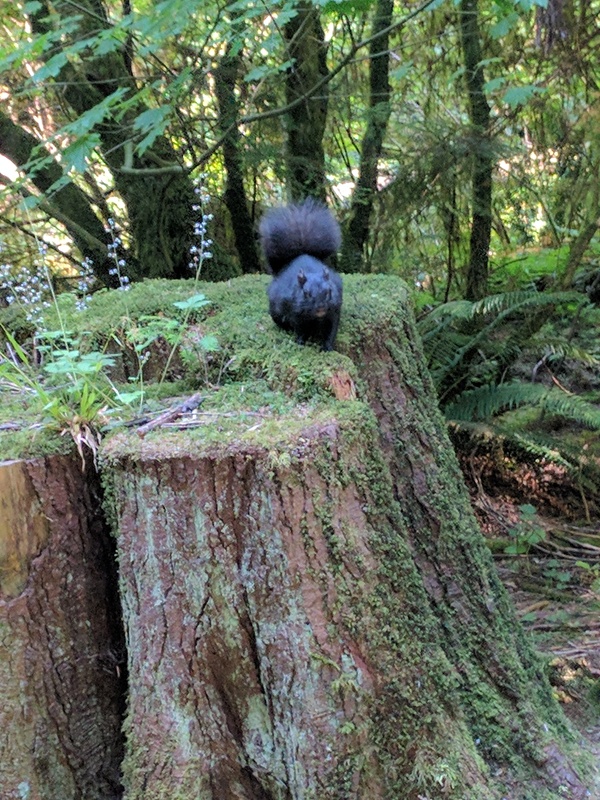 A friendly black squirrel in Stanley Park, a huge and incredibly beautiful place, ranked at the top of City parks worldwide. 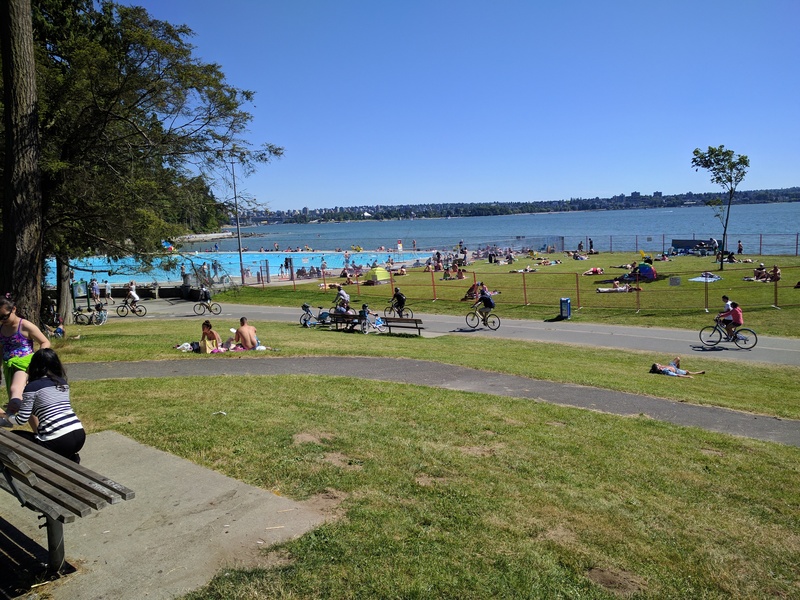 On the edge of Stanley Park, which occupies a large peninsula northwest of downtown. Sun worshippers and bicycles were everywhere. It reminded us of northern Europe. 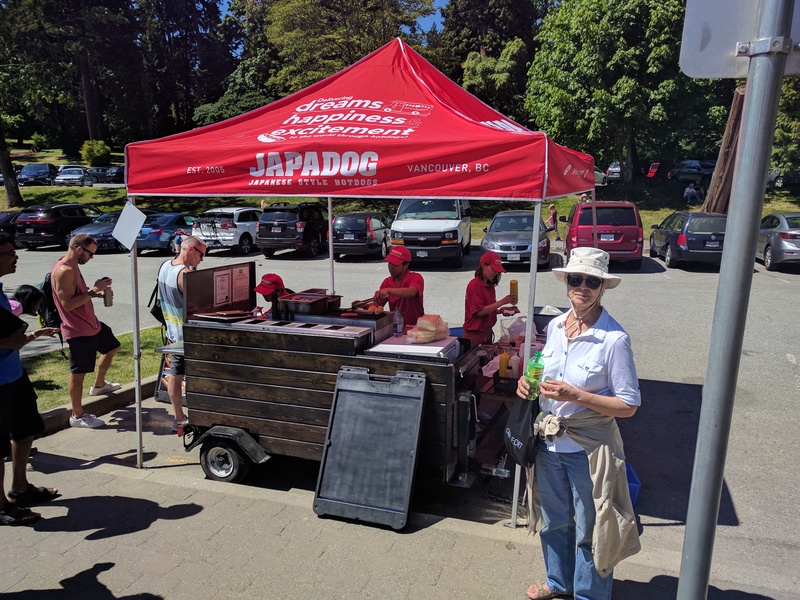 We stopped for a Japadog. They were wonderful. Far better than the Sonoran version in Arizona. 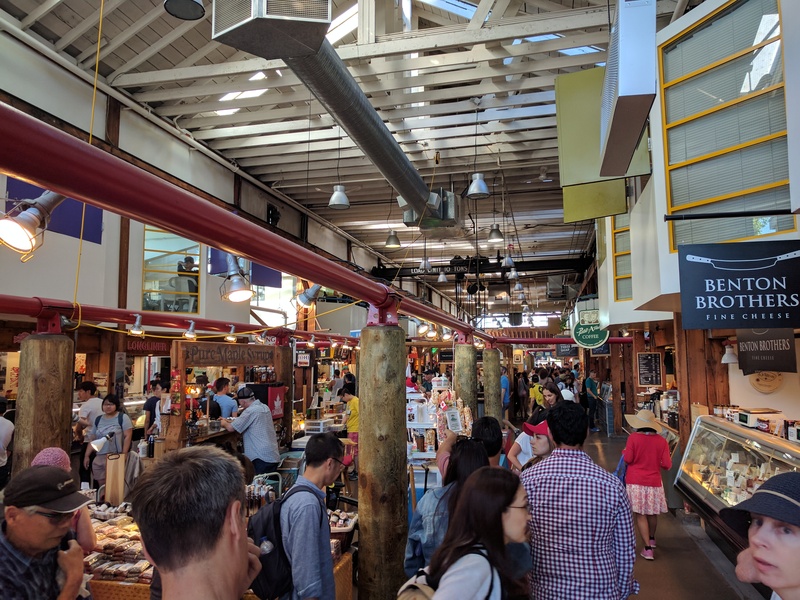 Granville Island Public Market — crowded and wonderful. Resting our feet a bit on an aquabus heading back towards Chinatown. Day two was spent at the huge botanical garden at the University. Here are a couple of pictures. Day three, 7/5, the kids arrive. 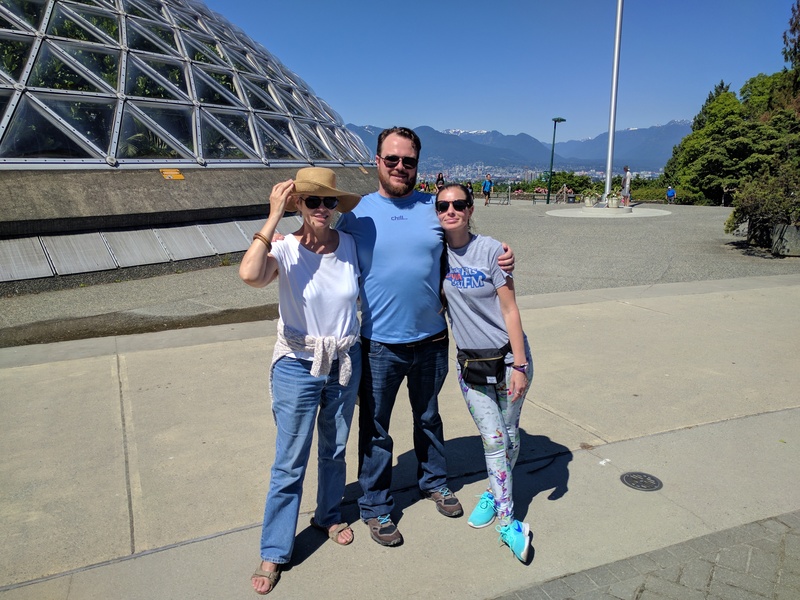 Here they are with Marie at the conservatory in Queen Elizabeth Park. 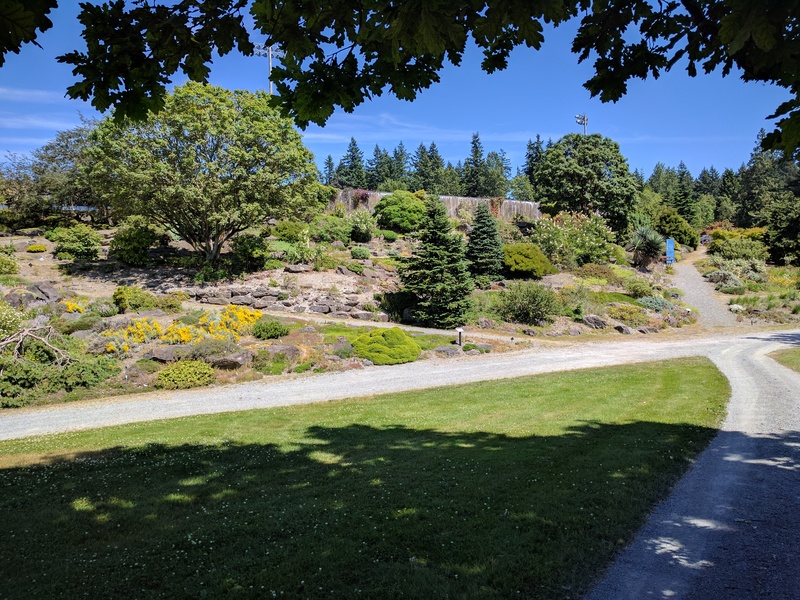 The gardens, built here in an old quarry, were gorgeous. 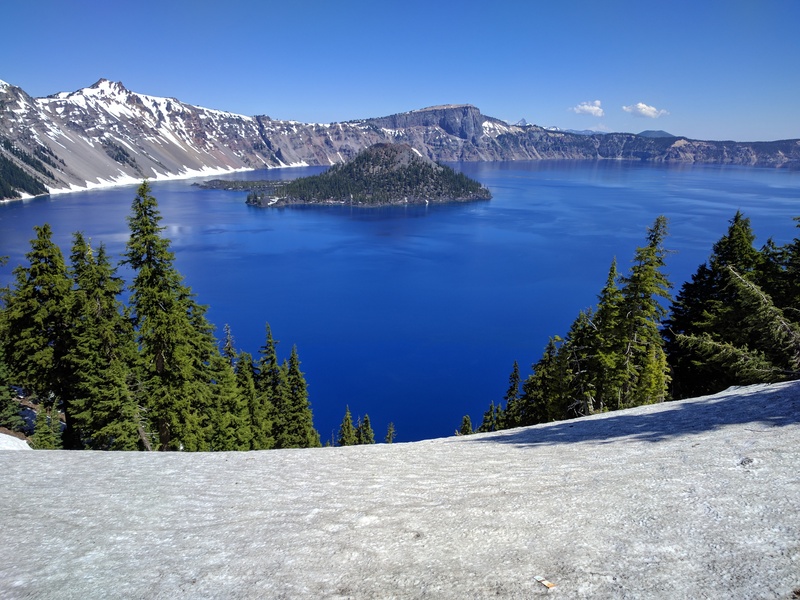 Crater Lake is indescribably gorgeous. The blues! Plus, there are many feet of snow still on the ground (44 ft. per year). A major part of the park won’t open until some time in July as a result. 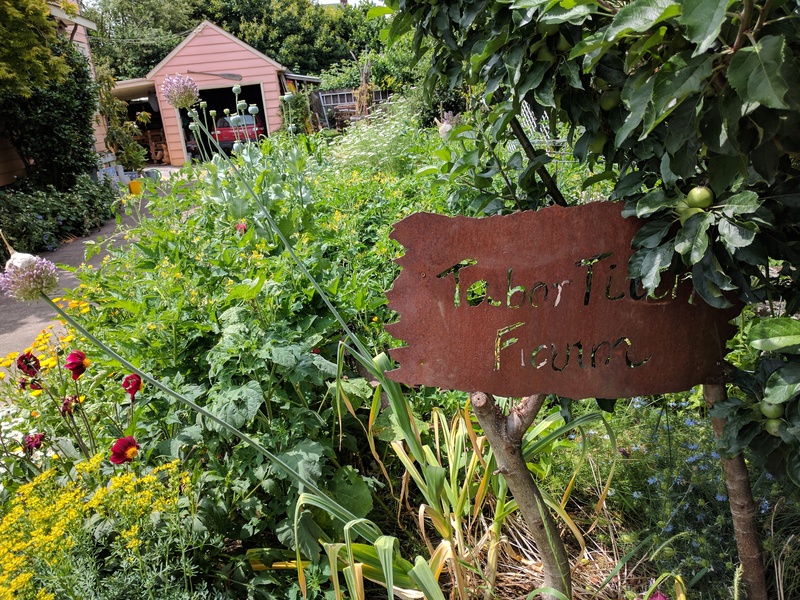 Tabor Tilthe Farm — a permaculture farm making concentrated use of a small urban yard in Portland and providing about three-quarters of the family food. 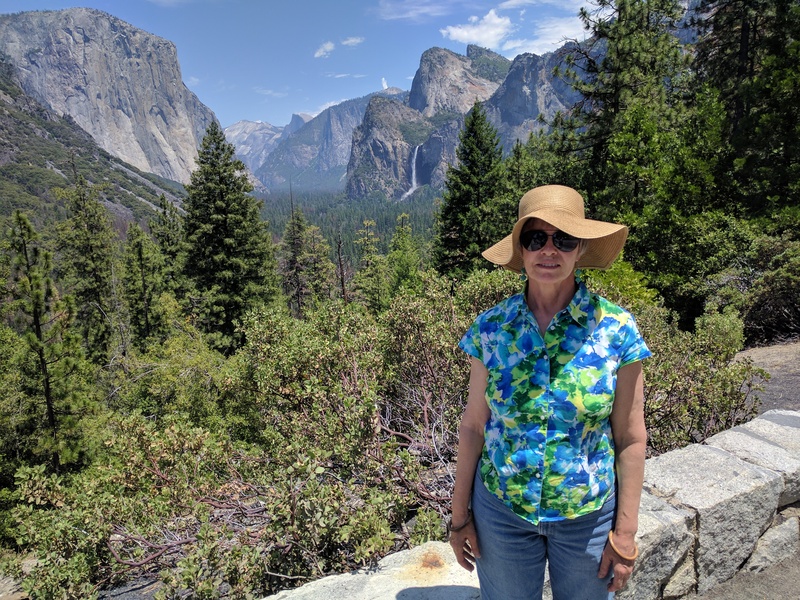 Following visits with friends and family in southern California, we’re heading to the Northwest, stopping at a few parks along the way. 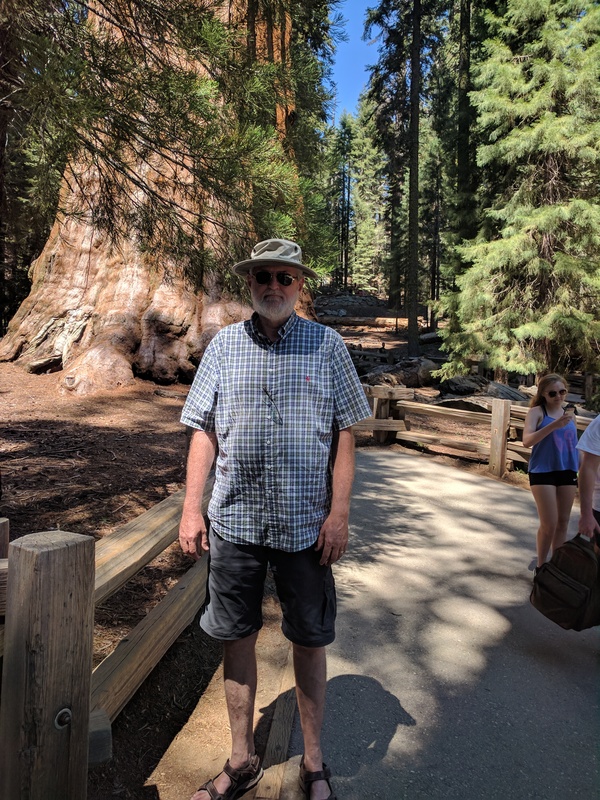 In front the most massive tree (Sequoia) in the world, dubbed General Sherman.